(Unreserved-51, Schedule Caste-15, Schedule Tribe-07, Other Backward Class-27) (Physically Handicapped-03 Posts). Pay Scale : Pay Scale in JMG-I Scale 23700-980x7/30560-1145x2/32850-1310x7/42020. Age as on 01.06.2016-21-30 years.Age relaxation-Scheduled Caste/ Scheduled Tribe Candidates 5 years,Other Backward Classes Candidates 3 years,P.W.D - Persons with Disabilities (VI/HI/OC) 10 years. Syllabus of Written Test-50 questions for 50 marks.Reasoning Ability-50 questions for 50 marks. Quantitative Aptitude-50 questions for 50 marks.English Language-50 questions for 50 marks. General Awareness (with special reference to Banking Industry)-50 questions for 50 marks. 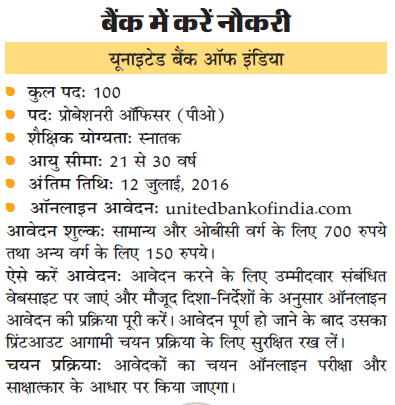 Application Fee : Rs.700/-for General and OBC candidates. (Rs.150/- for Schedule Caste/ Schedule Tribe/Physically Handicapped).